The IFA President welcomed the review of Farm Assist and the Rural Social Scheme as both are vital to the support of low income farmers. He said, the abolition of the income and child disregards by the previous Minister has had a dramatic effect on the qualification criteria for Farm Assist. IFA President meets Minister Leo Varadkar on Farm Assist review: An IFA delegation including Gerry Gunning, Rural Development Executive; Joe Brady, Rural Development Chairman; IFA President Joe Healy; and Bryan Barry, Acting General Secretary meeting with Minister for Social Protection Leo Varadkar on the review of Farm Assist. Joe Healy pointed out that with farm income under severe strain across most sectors, it is important that changes are made and the assessment process done in a fair way reflecting the volatility of farm income. The IFA President pointed out that the assessment process must take into account that farmers have to reinvest in their farms in order to sustain viability. Many farmers may be marginally over the limit of eligibility and as a result qualify for no support. This must change as the income opportunities, particularly in peripheral areas, are very limited. In relation to the Rural Social Scheme, IFA Rural Development Chairman Joe Brady pointed out that this scheme is a vital community employment initiative, particularly in areas where job opportunities are limited. IFA has proposed that the number of places on the scheme is doubled from the current level of 2,600. Also, flexibility must be put in place on the eligibility criteria to reach-out to other low income farmers and not just those on Farm Assist. 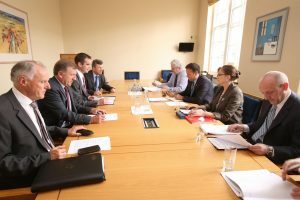 It was agreed that IFA would have further discussions with the Minister on this critical issue for low income farmers in advance of October’s Budget.